Recently we came to know about the books by Upendra Namburi and we came across some positive reviews for them. We, thus, decided to read them. Upendra writes thrillers and the numbers play a vital role in the tile of all his books. 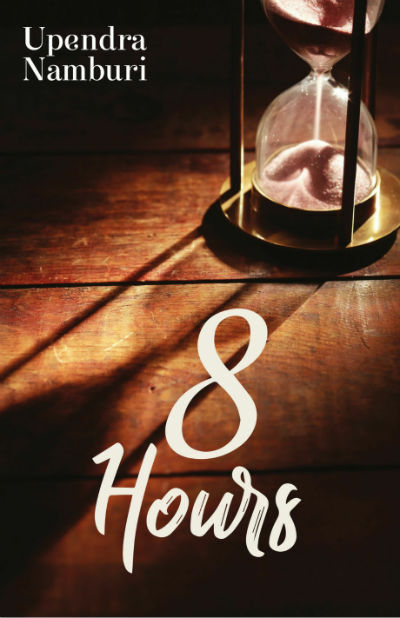 Actually, 8 hours is his third book, but, we got it for a reasonable price during an Amazon India offer! Fortunately, I got the chance to read 8 Hours by him. Let us have a look at the cover page of the book. As you can see the cover page has a good mixture of dark colors. The entire story progresses in the 8 hours during the night, so it fits with the plot. The title in the light color shows a positive hope at the end of those 8 hours (representing the early morning). So, though it is not exceptionally good, it goes in sync with the theme of the book. Aratrika Reddy, the CEO of ARYA is a strong willed woman. Unfortunately, it is neither the best nor the good time running for her company. It is well known fact that the business owners had to deal with the local politicians and as the business spread across the country, often the big players of politics also come into the play. Here, the company is trying to spread its wings outside of India and at least in terms of funding they have some foreign partners as well. Based on the results of recent most elections, the power is exchanged. And, Rathore, the son of one of the oldest rival of Madhusudhan Reddy (Aratrika’s father and the founder of ARYA), was now in the key position in the new government. So, he is on the way to settle the account with the Reddys. The bureaucracy has to play as per the wind, willingly or unwillingly, and eventually, all the big projects of ARYA, which are on the midway, started facing hurdles. Be it the permission issue or labor strike, ARYA management was at the receiving end. And, the company is on the edge of being bankrupt. Aratrika, doesn’t want to lose the game anyway. And, she had, 8 hours with her within which she had to do what she want! And all the principal characters are cunning in their own ways. There is no one who can be trusted. And there is no saint or straight forward person. Not in any camp. Be it Aratrika’s family, friends, opponents, politicians, bureaucrats or anyone else related to the power play in any way, they all are playing their games! Will Aratrika be able to save the company? Who is playing double game and why? Are there any personal demons of the prime characters playing their roles too? Well, you need to read the book to get the answer :). For me, three attributes are essential in any book. They are, the story itself, the way the events unfold and progress, and the characters. If the story has the substance, the book moves forward with good pace and has strong characters, then a reader will surely enjoy it. In that terms, I can say that the story itself is good and the pace in maintained throughout, with some bumps, of course. The climax could have been better. Though, it (the climax) shows hidden layers of some main characters which are referred in the story but didn’t play major active role in the incidents happening in those 8 hours, but still it is not in sync at the level it must have to be. And, the characters are really well explored. While we see distinctly mentioned black and white characters in most of the books, stories, TV Series and movies; in real life, a majority of the characters have shades of both. Of course, the proportion is different, person to person. And, you may meet the people who are completely white or black. The author, Upendra, tries remaining as much realistic as much possible by painting the characters of the good with shades of both black and white. So, you see strong characters throughout the book. And, as the story progresses, you can see different layers of their respective characters. In order to keep your reading experience as smooth as possible, I want to avoid spoilers. But I can surely say that while Madhusudan is not a good husband or father but a hardworking person whole built the empire, so his skills in business are beyond the boundary. Aratrika may have a broken married life and is captured by her own demons, but she is a strong willed woman who managed the business as good as it can be. Her “never say die” attitude, her quick decision ability, her knowledge of playing business and political games and intuition to pull the string in a way that give her the benefit she require, are worth appreciation. The author’s vocabulary is rich and he knows how to put sarcasm and punch lines effectively in such thrillers. We have all hurt each other. We are family, after all. I would have had time and leverage if I had that money. You’ve taken that away from me and, hence, I am compelled to take something away from you as well. That’s the circle of life. Arrogance can shroud a man’s judgement. It can also blind someone. Power is like shifting sand. Never ever believe that it’s truly yours. Deals were not about handshakes, but about clauses. You can find some inspirational speeches in the book which the company management, HR, professional speakers and politicians used to deliver. I would also like to add that the employees and their families who have made ARYA what it is today shall remain a top priority and we will always keep their interest and well-being in mind. Here are some more lines from the book, which I found interesting and I am sure that you will share the feelings. His was the shadow that accompanied her. You’re trying to take revenge and make money. Which do you want more right now? Another hyena has descended. What’s the fine print? How did you keep this quiet so long? A man would have known how to give the impression that the woman is in control. Revenge had taken its time coming, and now he wanted to be more alive than he had felt for several years. Her feet carried her towards the washroom and the reflection in the extravagantly large mirror startled her. I cannot keep myself from sharing these two blocks of writing from the book which are in the context of politics and money respectively. Money has no religion, Keith. They’ve got all the sides with them. Their status is independent of the powers at the Center or the state. The idea behind sharing some interesting segments of the book is that you yourself can the idea about the writing, and how it suits your taste. Some of the scenes in the book are really interesting, for example, the way Aratrika arranges a plane within few minutes to gift to a relative of a remarkable politician. There are many such scenes which will remain with you even after you finish reading the book. Some parts will remind you watching movies setup in corporate/political environment. The idea of setting up the book in a prime hotel is quite interesting as well. The book has all the potential to be adapted into a thrilling TV Series. In fact, if you’ve watched 24 (in Hindi or English), the chapter titles will remind of the scene/episode titles in the same. So, if you love reading thrillers, you can surely go for it. Overall a nice thriller. Some adult content is there and has to be read with that consent. Of course it remains true to its genre and the author has delivered a promising thriller.